Unlike Hanoi, where the local cuisine (read my guide about Hanoi food here) is oriented around traditional foods from complicated recipes, Saigon is better known for its simple street food, which is made up of a combination of the best dishes from 3 regions, leading to it being called the “Heaven of Vietnamese street food” by CNN. The perks of enjoying the Saigon street food lie not only in satisfying your stomach, but also offers you the chance to discover hidden gems while exploring small alleyways or big streets. As a local I am big sucker for street foods, and this is my street food guide, revealing some very nice dishes (with prices are lower than $1) and where they can be found. This affordable dish is made from a few simple ingredients, including sliced rice paper, dried shrimp, sliced mango, quail eggs, peanuts and herbs all stirred together. The combination of ingredients in the rice paper salad brings your pallet a wonderful mix of sour, salty and spicy flavours, resulting in an explosive taste in your mouth. It’s not recommended by a nutritionist because of low nutrition, but this dish is the first thing that comes to mind if you ask the Saigonese what their go to street food is, especially favored by students. Nguyen Thuong Hien street (District 3): This street is rice paper salad market as it sold in almost vendors. Saigon Notre-Dame Basilica or Turtle Lake (District 1) area: while visiting these attractions, don’t forget to stop by any vendor to give this tasty meal a try. This snack is frequently enjoyed by almost everyone in Saigon, thanks to its high nutrition and stomach friendliness. Crab soup is made of crab, chicken, quail eggs, mushroom, sweetcorn, herbs, adding some soy sauce and chili to spice up the flavour. It’s best to be eaten on a cool, windy or rainy afternoon. Unnamed street vendor, 84 Nguyen Du (District 1), near Notre-Dame Basilica: Crab soup has been sold here for over 20 years, making it the most well-known crab soup street vendor in Saigon to date. It opens from 12-22pm..
Hanh crab soup, Tan Dinh market (Nguyen Huu Cau District 1): the vendor opens from 6am to 6pm or until sold out. This drink has only recently been invented due to its unorthodox mix of ingredients, but this tempting snack has taken the young Saigonese by storm, making it a very popular drink among students. The recipe combines mango, sugar, fish sauce and chilli salt together in one cup, before being shaken by the vendor to provide a delicious cocktail, hence its name, a mango shake. The taste of mango shake will confuse you taste buds, but I find the sour and sweet of the mango complements the salty and spiciness of the chilli powder which when mixed up all together, make quite addictive drink for a snack lover (like myself). 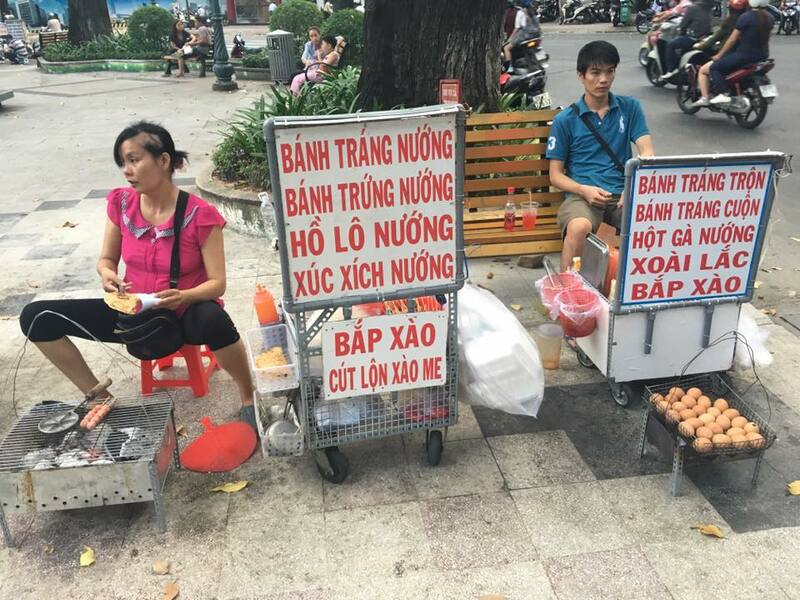 Nguyen Thuong Hien street, District 3: sold at most of the street vendors here, usually open from noon to late night. 106 Ham Nghi, District 1: open from 11am to 10pm. They also sell lots of other fresh fruits and snacks. Originating from Chinese-Vietnamese families, fried rice flour cake quickly became a popular dish of the Saigonese because of the interesting flavours from the eggs, manioca and rice flour. A dish of fried flour usually consists of pieces of deep fried rice flour cake, mixed with fried eggs, topped with pickles, sliced papaya, green onion and eaten with fish sauce. In order to find true authentic fried flour, you must visit a shop run by a Chinese family. China town (district 5): walk around Hai Thuong Lan Ong or Phung Hung street, you can find many stores that offer this tasty dish. Knocking noodle is a term, referring to a popular selling method of noodles that is used in Saigon. The noodles are usually sold on bikes or tuk tuks, moving one place another to serve customers instead of having a fixed store. Sellers usually use two wooden bars, knocking together to make noise to grab people’s attention, so called the knocking noodle. Customers usually buy and eat right next to the vendor or take away. A typical bowl of knocking noodle will have white noodle, thin sliced lean pork, fried onion, bean sprouts, chives and crackling. This dish is not sold in the morning, but from afternoon til midnight and a highlight of Saigon cuisine since it’s delicious yet the price is very affordable, a very popular dish among the working class and students. 197 Ton That Thuyet, District 1: one bowl costs you 15,000 but the quality is worth double the price, trust me! 358 Cach Mang Thang Tam, District 3 : you can either choose noodle with or without the broth, price is 12,000vnd per bowl. Baked banana with coconut sauce is one of the most well known snacks of southern people though its recipe is extremely simple. The ripe banana is covered by a rice layer, create an irresistible scent when baked on stove. The banana is served with lots of coconut milk, adding some copra, peanuts and cassava. The dish is quite sweet and will be very appealing to those with a sweet tooth. Chuoi nuong Nam Bo Ut Lua (115 Phan Dang Luu, Phu Nhuan, District 1): recognized as the best grilled banana by Street Food Festival 2013 in Singapore, this vendor is famous among both locals and travelers. The street vendors opens from 9am to 10pm, however, it’s quite far from city centre. Che chuoi nuong (230 Ly Chinh Thang, District 3): this place is also a little distance from the centre, so I usually visit here whenever I crave a decent grilled banana but too lazy to go Phu Nhuan district. For students and young people on the go, stir-fried sweet corn is a tasty quick snack which can keep you full until dinner time. This is a perfect alternative to other popular street food such as broken rice or bread. 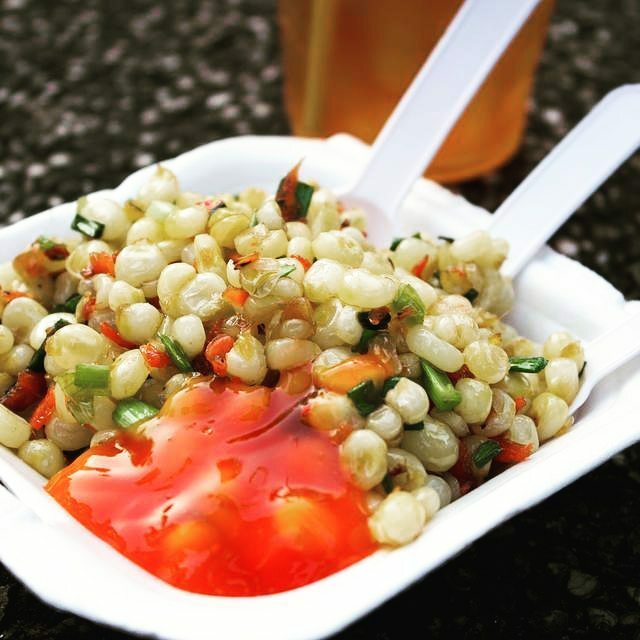 The corn offers similar levels of energy as other street food dishes, whilst also offering variation for your taste buds, to satisfy your foodie needs! Each vendor has their own unique recipe to make their dish stand out. A typical serving will have corn (lots of corn) stir fried with butter, with some dried shrimp and shrimp paste to spice it up, topped with chilli sauce and green onion. This infusion of different ingredients takes your tongue on a journey from sweet, to spicy and salty. If you ask me what is the perfect snack for a late afternoon, which everyone can enjoy, this is definitely the first thing that comes to mind. Gia Dinh park, Le Van Tam park: parks are always known as street food zones for Saigonese. Stir fried corn (and other street food) can be found in abundance here with affordable price. With less than $5, you can buy 3-4 servings of street food and indulge yourself throughout the afternoon. Ho Con Rua (turtle lake): stir fried corn is sold on a small bike but the street stall is noticeable as there’re always plenty of customers surrounding it. Specifically, the bikes usually linger opposite to Ho Chi Minh city University of Economic’s front gate. Just ask any locals for direction as this street stall is very popular in the area. Due to the high number customers, the vendor doesn’t cook the dish when ordered, as many other vendors do. Instead, she precooks her corn at home and stores it in a big saucepan to keep the food warm all the time, so you can expect have your food in 30 seconds or less. 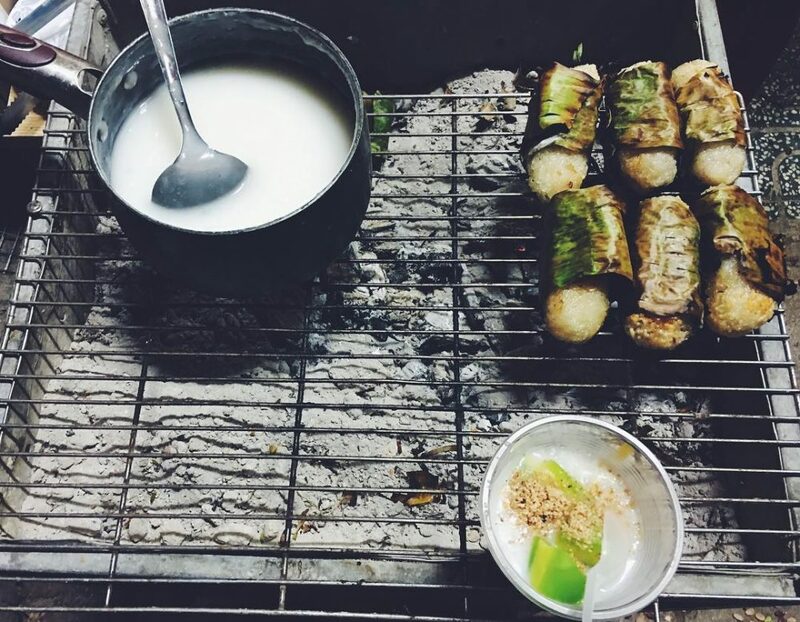 Bottom Line:If you’re afraid of street food hygiene or still confused with the location pointed out above, it’s better to accompany yourself with a local friend on your journey exploring Saigon street food. A local can bring you to the best street food alleyway, suggest you some yummy food with “sell-to-local” prices and tell you some insightful stories about the food culture in Saigon. Ho Chi Minh City food experience by Inspitrip offers a number of personalised journeys, depending on local insider’s suggestions and your travel preferences to give you an insight into what its like to eat like the Saigonese. So make sure you don’t miss the chance to immerse yourself in the biggest street food city in Vietnam.